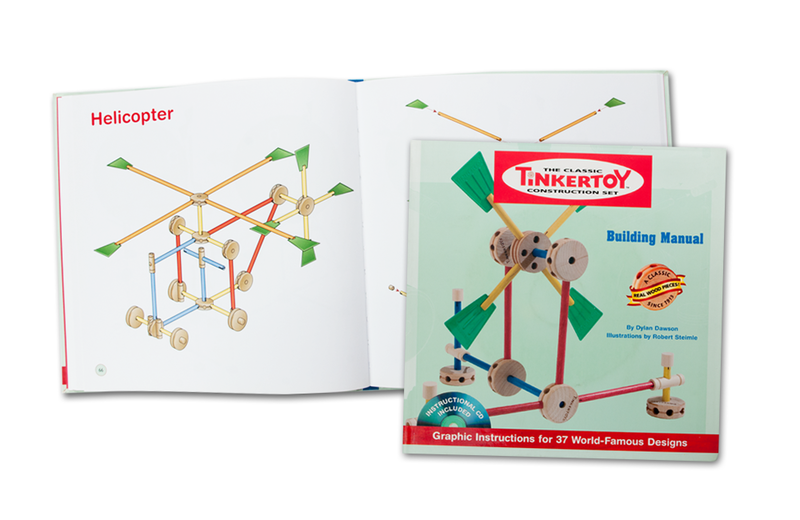 With a 100+ year track record, Tinkertoy construction sets remain a creative tool of choice for budding architects, designers, and engineers. With this continued fascination in mind, The Classic Tinkertoy Construction Set Building Manual offers a number of colorful projects that use the toy’s basic building blocks: rods and spools. Author Dylan Dawson and Illustrator Robert Steimle provide graphical instructions for 37 design projects, including a bridge, dragster, helicopter, and skyscraper. Each project starts with an illustration of the completed design, followed by a series of photos that walk children through the build piece-by-piece. The book is written to be enjoyed by kids ages 8 and up, although some of the more advanced projects will require parental support – a perfect excuse to re-visit a toy from your youth! In addition to the printed projects, the book also includes a CD-ROM (a reflection of the book’s 2007 publication date) containing a guide and additional projects. After a lengthy absence, Plok has been reintroduced in a comic strip that is sure to please fans of the classic Nintendo video game. The ColecoVisions Podcast is the place to go to learn more about this beloved console, games, and its place in gaming culture.